Have a bumper crop of summer squash? This Summer Squash Enchilada Casserole is so cheesy and good you definitely won’t miss the meat, plus it’s made extra easy in the slow cooker! Post may contain affiliate links. Click here to pin this now! I don’t know about you, but I am always looking for new ways to use up summer squash. Don’t get me wrong, I have lots of recipes that I turn to time and time again: Bread and Butter Zucchini Pickles, Yellow Squash and Farro Salad, and Zucchini Green Bean and Chile Slaw, but like all food bloggers, I am always searching for something new. Sometimes it can get a bit tiresome always looking for the next thing to cook, but then sometimes you stumble on a new favorite like this Summer Squash Enchilada Casserole. I don’t use my slow cooker all that much in the summer, but this is one recipe that I am going to be making again and again. It’s so easy. You start out by sautéing onions, garlic and squash. Then you layer enchilada sauce, tortillas, cheese and your veggies in the slow cooker. It’s that easy! It comes out all cheesy and so yummy you definitely won’t miss the meat. It calls for quite a bit of cheese – 4 cups! While I never say no to cheese, I think that I only used about 3 cups, also instead of mixing cheddar with Monterey Jack, I just bought the already mixed Mexican cheese blends. Served with some perfectly ripe red tomatoes, it was perfect! 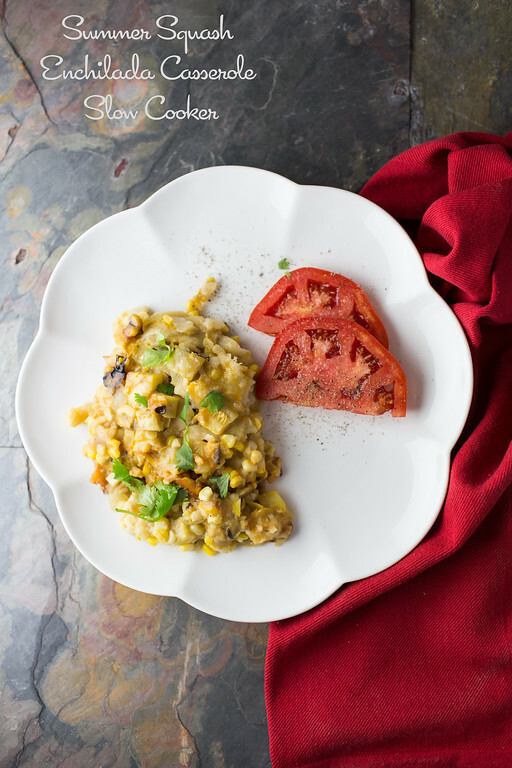 This Summer Squash casserole cooks up tender and delicious in the slow cooker. Heat the oil in a skillet over medium-high heat. Add the onion and cook about 5 minutes. Add the garlic, zucchini, yellow squash, oregano, and cumin and continue to cook until vegetables start to brown, about 4 to 5 minutes. Add the corn, sauté for a minute or two and remove from the heat. Mix the cheeses together. Pour about 1/2 cup of the enchilada sauce in the bottom of your slow cooker and spread it around. In layers add one-quarter of the tortilla strips, one-quarter of the enchilada sauce, one-third of the veggies, and one-quarter of the cheese blend and then sprinkle with one-quarter of the queso fresco. Repeat the layers, ending with the queso fresco. Your last layers will be tortillas, sauce and cheese (no veggies). Cover and cook on high for 2 hours or low for 4 hours. It’s good to have those kind of recipes for days when you are rushing and have a lot to do. This looks amazing and I feel I’m missing out on so many more awesome recipes that can be done with a slow cooker. Thanks for posting!! I am always looking forward to using my squash too! So glad I got a new slow cooker!! Can’t wait for this gem! Thanks for sharing with Saucy Saturdays! I love the idea of squash and enchiladas meeting! It almost makes me wonder why we’ve never done it before. Great idea! I’m looking forward to trying this. This sounds so good! Like you I am always looking for new ways to use summer squash. I never thought about using it in an enchilada casserole before! Genius! Right up my alley, this looks great! Sounds Delicious and so easy too. I love using my slow cooker but I’ve never tried Enchiladas in it. I’m definitely going to try this. Thanks for sharing ? I so appreciate the quick respite from all pumpkin everything. This looks/sounds fantastic – I want to dive right into that plate! Gosh those tomatoes look good. Summer will be here soon enough and I’m looking forward to heading off to a farmer’s market for some delicious, organic tomatoes. This looks great! What a great way to serve a ton of vegetables.